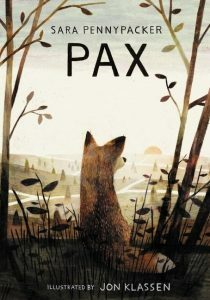 Every month we hope to feature a title that is on the 2018 Land of Enchantment Book Award nomination list.This month that title is Pax by Sara Pennypacker. Pax is a fox that has been raised by Peter since he was a kit. Peter’s father has to fight in some future, unnamed war and is taking Peter to live with his grandfather. On the way his father decides it’s time for Pax to live on his own in the wilderness and he forces Peter to say goodbye to his beloved pet, his best friend. Told in both Peter’s and Pax’s viewpoints, this book is heartbreaking and beautiful. You follow both characters as they try to make their way back to each other and are forced to rely on the kindness of others. Pax has never had to hunt for his food or know to be afraid/wary of possible predators/enemies. Peter immediately regrets his decision to leave Pax and embarks on his own personal journey back to his friend. The war that Peter’s father left for ultimately finds its way to Pax with real life consequences. Peter must also face the consequences that come with a 12-year old running away and traveling hundreds of miles on his own. This is a book most suited for middle grades (ages 8-12) but deals with a lot of heavy emotions. The friendships and relationships described in this book feel incredibly real and the conclusion will undoubtedly leave readers feeling all kinds of things but the emotional roller coaster is worth it! I picked this book up because it contains illustrations by Jon Klassen who is my favorite and I walked away feeling like a better person for having read this story.